Last week I participated in a workshop titled ‘Punishment as a Crime? 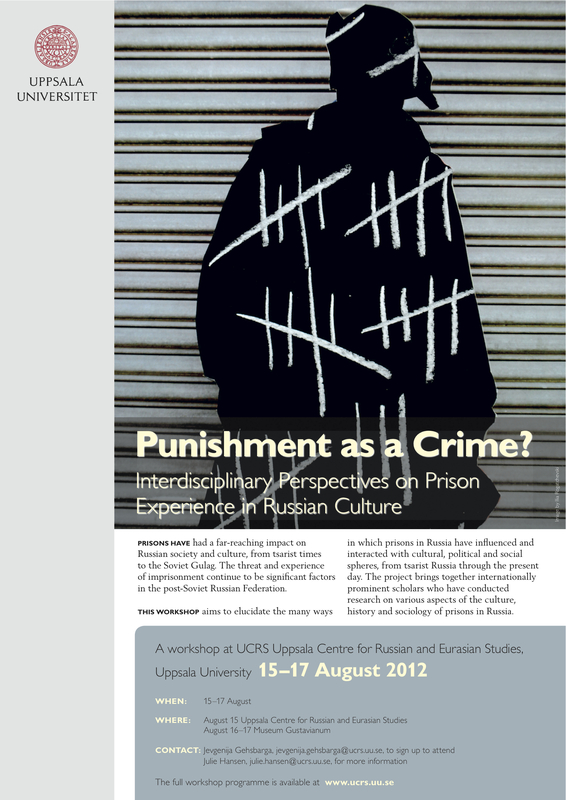 Interdisciplinary Perspectives on Prison Experience in Russian Culture’, at Uppsala University’s Centre for Russian and Eurasian Studies. The programme, which is available here, was notable for its wide range of papers and approaches. The imperial, soviet and post-soviet periods were all covered, and a number of speakers offered comparative analyses of aspects of imprisonment in different eras. It was also truly interdisciplinary, with historians and social scientists speaking alongside literary and cultural critics. We even had the salutary experience (particularly for those of us used to working solely with books and in theory) of an insider’s perspective, in the form of RUSI research fellow Dr Igor Sutyagin, who spent ten years in prison and penal colonies on trumped-up espionage charges, being released as part of the ‘spy-swap‘ that followed the discovery of a Russian spy ring in the USA in 2010 (better known as the Anna Chapman affair). Approaches ranged from very detailed analyses of prison and forced labour systems to broader ethical and methodological discussions about how imprisonment in Russia should be treated, leading to some significant, though always polite, differences of opinion. My only complaint about the whole event was that there was never enough time for discussion – in practically every session this was cut off when there were still numerous participants wanting to ask questions or make comments. But this shows what a rich and complex topic of research it is. I’m not going to attempt a comprehensive report of the proceedings, but instead just want to highlight a couple of common themes that resonated most strongly with my own work, and for that reason I’ll focus mainly on the literary/cultural angle. The first relates to continuities. This was the main focus of several papers, including Judith Pallot’s discussion of echoes of the Gulag in today’s penal geography and the treatment of prisoners, Elena Katz’s analysis of the image – and reality – of the prisoner’s wife, from the Decembrists to the present day, and my own paper on the depiction of criminals in labour camps of the imperial and soviet eras. But it reverberated through practically every presentation, revealing the stasis inherent in the Russian penal system. So many of the points made about aspects of the system and its inhabitants at one time could apply to other times, from the inconsistency in conditions between different penal institutions to the absence of legality to its effects on prisoners and the role of the criminal subculture. Igor Sutyagin’s paper startled me because the effects on the prisoner he described were so similar to those we see in Shalamov’s Kolyma Tales. It’s not that I assumed contemporary Russian prisons were in any way pleasant places, but to hear the experience of them framed in terms that are comparable to one of the most extreme representations of the Stalinist camps gave me food for thought. Unsurprisingly in this context, the questions of the mechanisms we use to compare different eras, and whether the Russian system can be compared to imprisonment in other countries, were raised more than once. On the first issue, is the judicial system (or degree of adherence to it) most important, conditions in prisons and camps/colonies, or their effect on the inmates? Should we be examining the question by comparison with life outside the penal system (for many workers on collective farms and industrial sites in the 1930s, living conditions were not much better than those in the Gulag), or, as one delegate suggested, by how much life outside changes over a period of imprisonment and to what extent an ex-convict can reintegrate into life after prison? On the second question, some rejected the possibility of comparison with ‘western’ prisons, but others argued that there is no such thing as a homogenous western system of incarceration, and while prisons in our host country may have nothing in common with those in Russia, US penitentiaries and some UK prisons are comparable. That such a comparison can be fruitful was amply demonstrated by Andrei Rogatchevski’s thought-provoking analysis of the prison writings of Eduard Limonov and Jeffrey Archer (a name I never expected to encounter at a Russian studies conference!). Andrei Rogatchevski’s paper also chimed with my own in taking creativity and the writer’s encounter with prison culture as its main theme, placing emphasis on the authors’ status as outsiders. The question of artistry was also strongly in evidence elsewhere – in particular, in Andrea Gullotta’s paper on Gulag humour, and Helena Goscilo’s examination of criminal tattoos. Both these papers focused on the development of prison and camp culture across time, and its role in contemporary society. The latter was also the subject of Valentina Shatalina’s exploration of the moral and psychological dimensions of the prison theme in Russian television serials. 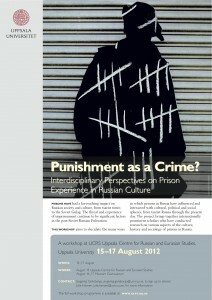 The transmission of conceptions of incarceration beyond the barbed wire and prison walls has played a significant role in both popular and more high-brow Russian culture, and the workshop helped to reveal the range of that influence and clarify some of the reasons why it has become such an important theme. My thanks to the organizers of the workshop, Julie Hansen and Andrei Rogatchevski, the administrators Jevgenija Gehsbarga and Nazgul Engvall, and all the participants for their good company, interesting papers, and lively discussion. I look forward to revisiting that discussion in the planned publication.